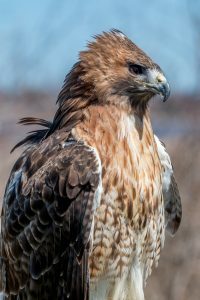 Have you ever driven down the expressway or thruway and noticed a fierce-looking, large bird atop the light or telephone pole intently looking at the ground on the side of the road? 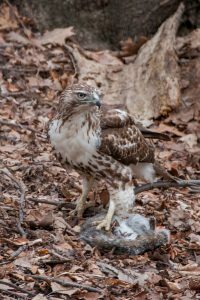 That bird is most likely a Red-tailed hawk (Buteo jamaicensis), the most widespread and familiar hawk in North America, searching for its next meal. Adults can easily be identified by their cinnamon-red coloring on the top of their tail while the juvenile’s tail is chocolate-brown and banded. Dark belly-bands and patagials (“dirty armpits”) on the leading, underside edge of their wing are two other easily identifiable field markings. 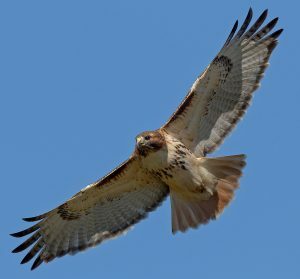 You may also find this highly adaptable hawk sitting high up in tall trees along open fields waiting to swoop down after their prey, or flying over fields, hunting for a varied diet including mice, voles, snakes, birds and rabbits. They also can be found in your local park or large back yard, if you’re lucky enough, hunting another menu item favorite, squirrels. In the north-eastern range, breeding season usually occurs in late February through March, and starts with a courtship ritual such as “sky-dancing” to either start or strengthen their monogamous bond. The female and male soar together in high circles, vocalizing with their hoarse, raspy shrill. The male may fly higher and then dive repeatedly and swiftly in spectacular maneuvers, even touching the female with his talons or passing prey to the female in flight. Red-tailed hawks are considered partial migrants. Although many are year round occupants, birds of the far north will migrate south in late fall to avoid harsh winters and then will return to their breeding ground in early spring. In late summer and early fall, there is another type of movement called natal dispersal. This is where the juveniles move from their hatch site to find a breeding territory after their parents stop feeding them. Some of the juveniles will stay close to where they were born, while others will move hundreds of miles or more away, creating a false northern migration in some cases. 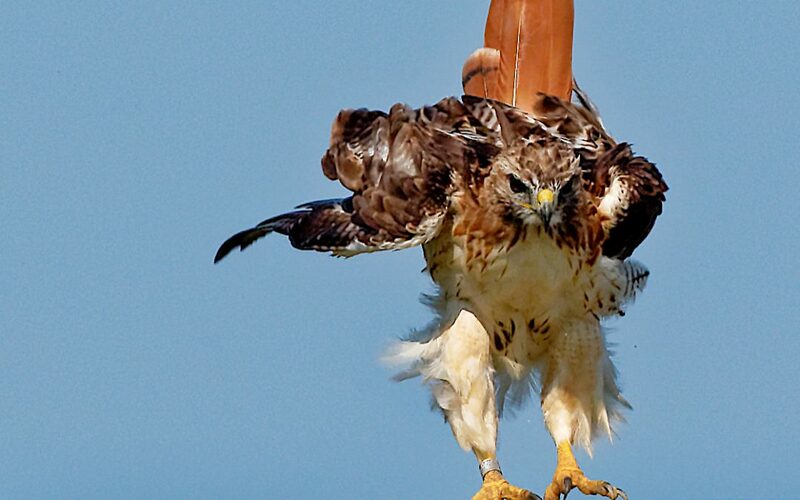 The Red-tailed hawk is the featured species of this year’s Bird of Prey Days event. Come on out to learn more about this stunning raptor.